Traditionally, the Upper town was the wealthier part and commercial outlet, while the Lower town served as the manufacturing area. The historical centre includes the Great Square, Huet Square, the beautiful Passage of Steps connecting the upper town to the lower town, the well-known Bridge of Lies, Goldsmiths' Square and the Small Square. * The seven walled citadels populated by the Saxons of Transylvania were known in German as the Siebenburgen. For hundreds of years, this walled town in the heart of Transylvania was one of the most powerful and prosperous strongholds in Europe. Surrounded by imposing walls, Sibiu's original fortifications included 39 defensive towers, five bulwarks, four gates and five artillery batteries. Three 15th century towers have withstood the test of time: Harquebusiers' Tower (Turnul Archebuzierilor), Carpenters' Tower (Turnul Dulgherilor) and Potters' Tower (Turnul Olarilor). 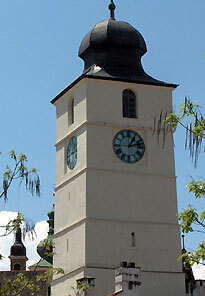 The 16-th century Great Tower (Turnul Gros) was the site of Sibiu's first theatrical performance, staged in 1778. At the centre of the upper town are three beautiful squares. The Great Square is the site of the Roman-Catholic church and the Brukenthal Palace, where you will find one of Romania's most important art collections. The square is linked to the Little Square by a passage beneath the Council Tower, which is worth visiting for the excellent views over the town. The third square, Huet Square, is dominated by the Evangelical Cathedral. First mentioned in a written document in 1411 as a grain market, the Great Square – the largest square in the city, has been throughout the centuries a quiet witness to the town's lively merchant activity, assemblies and even public executions. Located in the heart of the old walled city, the square was designated an architectural monument by UNESCO and features some of the most impressive buildings in Sibiu. The north side of the Great Square is dominated by the Roman-Catholic Church (Biserica Romano-Catolica). This beautiful baroque structure with classical decorations was built between 1726 and 1738. The tower was attached to the nave in 1738 and one year later, a cross was seated on the top. The completely renovated interior is magnificent with gold-laced walls and colorful ceiling frescoes. Intricate stone carvings cover much of the nave while the side altars and colonnades glisten with pink marble. The fresco behind the altar was painted in 1777 by Anton Steinwald. Inside the church is the stone grave of Otto Ferdinand de Abensberg, commander of Transylvania between 1744-1747. Organ recitals are usually held once a week. At the corner with Avram Iancu Street stand the old mayor's residence and the imposing Council Tower (Turnul Sfatului). 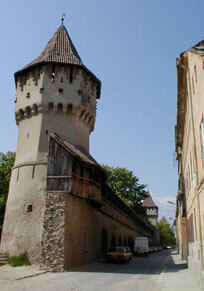 Built in the 13-th century, this tower was used as entrance gate to the second row of fortified walls built around Sibiu. Throughout the centuries, the Council Tower served as a grain storehouse, a fire watchtower, a temporary prison and even as a museum of botany. The roof, originally built in pyramid form, has undergone various changes, culminating in the addition of four corner turrets in 1826. On the top floor, an observation deck allows a bird's-eye view of the historic town and the Fagaras Mountains beyond. Completing the picture is the fairy-tale Blue House, an 18-th century baroque house bearing the old coat of arms of Sibiu on its facade. From the Great Square, walk through one of two tunnels under the arches of the Council Tower to arrive at the Little Square. This second fortified square was home to the town's most prestigious master craftsmen, who lived in rows of arcaded houses along the north and east sides. Today, small shops, cafes and businesses line the square. 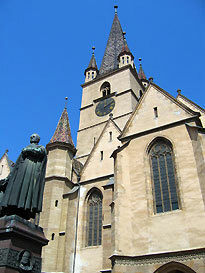 Huet Square is home to a mix of gothic buildings dominated by the Evangelical Cathedral (Biserica Evangelica). This impressive structure, featuring five pointed towers, was built in 1520 on the site of an old Roman basilica. The simple, stark interior is in total contrast to that of the Catholic Church. A gigantic fresco, painted by Johannes of Rosenau in 1445, covers much of the chancel's north wall. The mural shows the Crucifixion and marks a transition in painting from late-gothic style to renaissance style. On the south side, the choir loft boasts a beautiful fan-vaulted ceiling, home to a baroque organ designed by a German master in 1671. Six thousand pipes were installed in 1914, making it the largest organ in Romania. Here, you can also find the city's only fully German school, the Samuel von Brukenthal Gymnasium, which exemplifies the city's proud German heritage. The Lower Town comprises the area between the river and the hill, and it developed around the earliest fortifications. The streets are long and quite wide for medieval city standards, with small city squares at places. The architecture is rather rustic: typically two-storey houses with tall roofs and gates opening passages to inner courts. to the lower town. One of them passes beneath the iron Bridge of Lies. Built in 1859 by Fredericus Hutte, this was the first wrought iron bridge in Romania. Legend has it that the name derived from the merchants' fiery disputes which flared up around it and the passionate but transitory vows of young lovers who often met here. The 13th century Passage of Steps, an architectural masterpiece with twin staircases and archways, connects the Upper Town to the Lower Town. 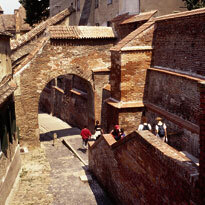 Built in the 13th century, it is one of the most picturesque places in Sibiu. At one end of the passage stands the city's oldest building which now hosts the oldest restaurant in Romania, The Golden Barrel (Butoiul de Aur). The Goldsmiths' Square, a peaceful and intimate square, is surrounded by charming old houses with medieval windows, doorways and turrets. For many years, it was the main point of passage between the Little Square and the Lower Town, the two connected by a 15th century stairway. Located at the north end of Onofreiu Square (Piata Onofreiu), the bastion is named after Sibiu's 16-th century mayor, Petrus Haller, who had the red-brick tower built in 1551. Constructed between 1902–1906 on the site of a former Greek church, it shares a similar style with Saint Sofia Cathedral in Istanbul, Turkey. The interior is dominated by a massive gold chandelier and features neo-Byzantine decorations. 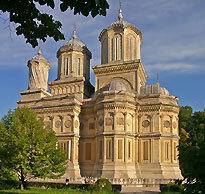 This is the second largest Orthodox cathedral in Romania (the biggest one is located in Iasi). Built in 1474, the site was home to a Dominican Monastery until 1543 when the Lutherans took over. Known under the German name of Klosterkirche, it became a Ursuline Monastery in 1755. The Ursulines changed the gothic interior to baroque style. Outside, the building still features many of its former gothic details, including the portal and the piles. Inside, the church has three altars and beautiful paintings representing various saints and protectors of the church. was built between 1788 - 1789 and renovated between 1802-1803.
beautifully painted by Nicolae Brana in 1960. Although documents attest the existence of Jews in Sibiu since the 12th century, the Jewish community of Sibiu was never among the biggest in Romania. In 1940 the town had some 1,300 Jews, three synagogues, three rabbis, two cemeteries and two ritual baths managed by the Sephardic and Orthodox communities. Today, the handful of Jews who remain in Sibiu hold weekly and holiday services at the Great Synagogue. Built by architect Szalay Ferenc in 1899, with funds collected by Sibiu's small Jewish community, this synagogue boasts a neo-gothic façade. Inside, it has a basilica aspect with three naves mounted by lofts. Closed on Mondays and on the first Tuesday of every month. Winter Schedule: Wed. - Sun. : 10 a.m. - 6 p.m.; Closed Mon. and Tue. Map of hiking/ biking trails starting in Medias or in Sighisoara. 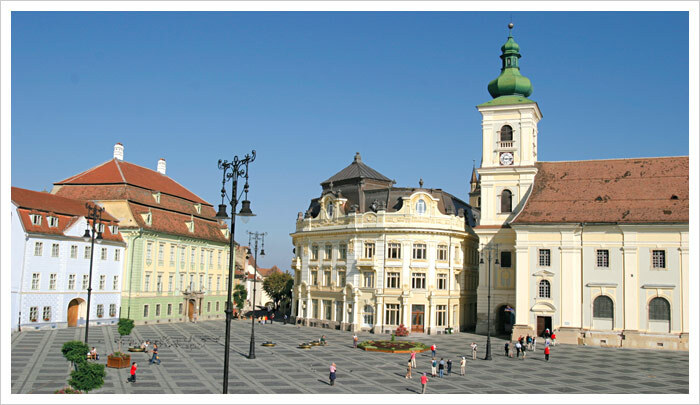 Sibiu is home to Transylvania's finest art museum, the Bruckenthal Museum. 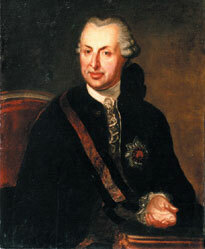 Founded in 1790 by Samuel Brukenthal, the governor of the province, the museum opened to the public in 1817. It is the oldest museum in Romania and one of the first museums in Europe. The art collection includes paintings by Rubens, Van Dyck and Teniers, as well as works of German, Austrian and Romanian masters. Additionally, it features a 16th century silverware collection, painted glass icons and 350 rare books, many dating to the days of the first printing press. Open: Tue. – Sun. : 9 a.m. - 6 p.m.
wintertime 10 a.m. – 5 p.m.); Closed Mon. (which goes all the way to Rasinari). the tram runs every 30 mins and every hour the rest of the day. The museum illustrates the technological legacy of the Romanian people. There is a wonderful collection of wooden farmhouses, a cherhana (a traditional collecting and storage point for fish) and sheepfolds, as well as a wooden church and two traditional inns. Guided tours are available. Another option is a visit by horse-drawn carriages (ladies, the driver will kiss your hand in greeting, an old Romanian custom). This museum is housed in the Old City Hall (Primaria Veche), which dates to 1470 and boasts typical Transylvanian gothic civil architecture. Here, you can learn the history of the city and the region from Neolithic and Roman times to the present. In addition to rich collections from the Middle Ages and the baroque era, there is a fine silverware exhibit. One of the oldest and richest of its kind in Romania, this museum was founded by the Transylvanian Association of Natural Science (Siebenburgischer Verein für Naturwiessenschaften in German) in 1849. An astronomic observation centre also is located here. Open: Tue. – Sun. 9 a.m. - 6 p.m. Collections of painted furniture, costumes-textiles-embroideries and pottery, initiated by Emil Sigerus, the most important collector of Transylvanian Saxon Folk Art at the end of the 19th century. The museum also includes the original collections of the Carpathians Transylvanian Museum or MSVK opened in 1895 by the Siebenbugishen Karpathenverein Association. Founded in 1966, the museum features a collection of weapons, medals and stuffed animals. Some of the exhibits are over 100 years old, such as the hunting trophies brought after a long safari in Africa by Colonel Spiess, who was a Master of Hunting of the Royal House of Romania. Open: Tue. – Sun. 10 a.m. – 6 p.m.; Closed Mon. The Franz Binder collections, housed in the "Hermes House" (initially called "The House of the Small Handicraftsmen's Association") built between 1865 and 1867, were established in the 19th century through donations and acquisitions from travelers and collectors. The permanent exhibition, "From the art and culture of the world – the people of the world," displays objects from various parts of the world, including northern Africa and the springs of the Nile, China, Japan, Oceania, Asia Minor, Brazil, Lapland and Australia. Housed in a 16-th century building where the oldest pharmacy in Romania, La Ursul Negru (The Black Bear), operated for over 150 years, this museum showcases some 6,000 pieces of medical equipment from the 16th to the 19th centuries, coming from chemist's shops, medical institutions and individuals. It should be noted that Sibiu had more chemists than any other town in Transylvania. 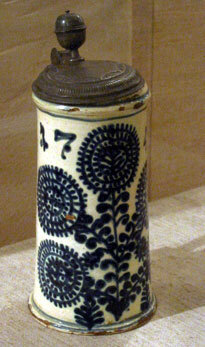 The collections of the museum cover the whole range of medical instruments, from surgical pouches, microscopes, different bowls made of wood, china, glass, bronze mortars, stands with balances and weights in the Viennese style to the oldest piece of the collection, a 1597 bronze mortar used for preparing medicines. At the front, a reconstructed shop is decked out with wooden Viennese counters and stacks of glass jars creating the atmosphere of an 18-th century "apoteka" (German for "pharmacy"). Opened in 1994, this museum displays 23 standard gauge steam engines, 10 narrow gauge steam engines, three snowplows and two steam cranes. The steam engines were built between 1885 and 1959 in Romania (the Resita Factory and the Malaxa Factory in Bucharest), Germany (Henschel, Borsig, Schwartzkopff) and USA (Baldwin). The museum is located opposite the main railway station. Sibiu makes an ideal base for the exploration of the nearby countryside and villages which display an interesting mixture of Saxon and Romanian traditions. How to get here: Local trains from Sibiu to Sebes stop at Sibiel (25 minutes), Saliste (35 minutes) and Miercurea Sibiului (1 1/4 hours). Rasinari, dating to 1204, is the oldest, followed by Talmaciu (1318), Orlat (1322) and Saliste (1354). Saliste claims the oldest church, housing beautiful interior frescoes (1674), while Poiana Sibiului's wooden church was built in 1771. How to get here: Rasinari is connected to Sibiu by a roughly 4-mile tramline through the Dumbrava Forest. The tram runs every 30 mins. at peak times (7:00am – 9:00am and 1:00pm – 3:00pm) and every hour for the rest of the day. One of the wealthiest villages in the region, Rasinari is famed for its local carpentry and sheep farming. The village has an Ethnographic Museum (open Tue. – Sun. 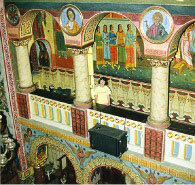 10:00am – 5:00pm) and a painted Orthodox church built in 1752. 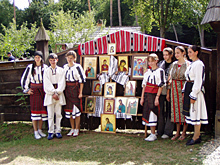 The annual Pastoral Album Folklore Festival takes place on the third Sunday of April. Painting on glass has been a tradition for 200 years in these villages. In 1968, the founder of the museum, priest Zosim Oancea, started to collect 18-th and 19-th century icons richly painted on glass. Today, the museum exhibits the largest collection of painted glass icons in Europe - more than 700, as well as furniture and ceramics. Cisnadie was mentioned for the first time in a document from the year 1204 under the name "Rivetel." In the 12th century Saxon colonists settled here and in 1323, the German name Heltau is mentioned. During the centuries, the town flourished, particularly the guilds of sicklesmiths and wool weavers. Weaving remained the traditional occupation of the townspeople until the 20th century, when large textile factories were built. The Textile Museum (Expozitia Muzeala "Istoricul Industriei Textile") has a comprehensive coverage of this local industry. The museum, located at Str. Apararii 2 is open Mon. – Sat. 8:00am to 4:00pm. 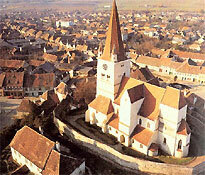 The most important architectural site is the Cisnadie Fortified Church located in the town centre. A climb to the belfry offers a super view of Cisnadie's red rooftops and courtyards, while in the distance, nestled at the foot of the Cindrel Mountains, you can catch a glimpse of Cisnadiaora. Cisnadioara has a Romanesque church dating from 1223 and a citadel on top of a high hill above the village which frequently withstood Tatar attacks. The villagers often took cover in the citadel, which they defended by hurtling down rocks which had been carried into the citadel by aspiring husbands. It was believed that no young man was marriage-worthy until he had carried a heavy rock from the riverbed up the steep track. In the centre of Cisnadioara stands an old baroque church. The local village museum contains an attractive collection of artifacts and tools from Saxon households. Built by the Transylvanian Carpathian Society (S.K.V.) in 1894, Paltinis (German: Hohe Rinne) is the highest (4,724 ft.; 1,440 m altitude) and oldest tourist resort in Romania. A favorite for ski enthusiasts, Paltinis, with its beautiful location, fresh air, and numerous hiking opportunities, is also an attraction for summer hikers. Marked trails make it easy to reach the main points on the surrounding mountains. Most of the trails are suitable for mountain biking, as well. Travel advisory: The road is open only a few months a year (mainly late June to late October) due to snowfall. The winding road with long S-curves, steep ramps and descents is a challenge; the average cruise speed is around 25 mph. Make sure your car is fit for the trip and bring warm clothes. The Transfagaran Highway will be closed November 1st to July 1st. Some 25 miles east of Sibiu, DN7C (national road 7C), also known as the Transfagarasan Highway, branches off the road to Brasov, heading straight for the towering Fagaras Mountain range. This two-lane road, the highest paved road in the country (6,673 ft; 2,034 m), connects the two historic regions of Transylvania and Walachia, namely the cities of Sibiu and Pitesti. The road, built across the Fagaras Mountains (part of the southern Carpathians, the highest mountains in Romania), makes for a perfect weekend trip from Sibiu (or even a very long day trip) if you have your own transportation, offering breath-taking views around every one of its many twists and turns. The Transfagarasan Highway was built in the 1970s so that Romanian troops and tanks could cross over the Carpathian Mountains quickly in case of a Soviet-led invasion. The efforts made in its construction were enormous. Built by soldiers in only four and a half years, it required more than 13 million pounds (6 million kilos) of dynamite to blast through the rocks on the north side - that's 625 train wagons. It has more tunnels and viaducts than any other road in Romania. In the vicinity of the highest point, at Lake Balea (Balea Lac), the road passes through Romania's longest road tunnel (about 2880 ft; 900 m), connecting the north and south valleys. The difference between the two sides is stunning. While on the northern side the landscape is barren and alpine as the road makes its way up an amazing glacial valley, on the southern side the road drops gradually through pleasant green scenery. If you will continue your journey on the south side towards Pitesti, you can make a stop at the beautiful Vidraru Lake & Dam, the (real) Dracula Castle ruins at Poienari and Curtea de Arges Monastery. Traveling through the twisting and turning gorges of the Olt River to Curtea de Arges, you can make a stop at the beautiful Cozia Monastery. Once you get to Curtea de Arges, visit the 14-th century Princely Court and the Princely Church with its lovely interior frescoes. According to tradition, Curtea de Arges was founded in early 14th century by Prince Radu Negru, succeeding Campulung as capital of Walachia, hence its name Curtea (The Court). Another stunning architectural gem in town is the 16-th century Curtea de Arges Monastery (Manastirea Curtea de Arges), topped with two towers spiraling in opposite directions. Behold the sad legend of Manole* as you take in its beauty. Romania's first two kings and queens are buried here. * The legend says that Manole, the master builder, had to sacrifice his wife by locking her into the wall to stop the monastery from falling apart. Fifty miles west of Curtea de Arges, you can visit Horezu Monastery, the largest monastic settlement in Walachia, founded in 1690 by Prince Constantine Brancoveanu. A masterpiece of the "Brancovenesti" style and a UNESCO World Heritage site, Horezu is renowned for the richness of its sculptural detail, the treatment of its religious compositions and its painted decorative works. The monastery houses precious collections of frescoes and icons dating from the end of the 17th century and the beginning of the 18th century. The nearby village of Horezu is home to one of the largest pottery centres in Romania. Nearly a century ago, local nuns taught the villagers how to make and paint pottery and ever since, people have come from far and wide to get their hands on Horezu's ceramics. Weekly classical music concerts take place in the newly renovated Thalia Hall, a concert hall and theatre dating from 1787. One of the leading Romanian theatres, with origins dating back to 1787, it attracts some of the best-known Romanian directors. This theatre has both Romanian-language and German-language sections and presents an average of five shows a week. Specializing in puppetry, mime and non-conventional shows for children and teenagers, this theatre presents shows in both Romanian and German. By car - via scenic routes over the Carpathians (approximately 4 hours and 30 minutes). 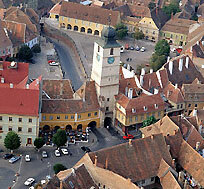 Sibiu airport is located 3.5 miles west of the city centre. Number 11 bus (to downtown) stops 300 yards away from airport. Romanian currency is necessary to purchase tickets onboard. (bus line 11 is shown in purple). Taxi service to downtown also available. Aproximate trip cost 20 Lei (RON) - approx 5 USD. Several bus and trolleybus routes connect Sibiu's main areas and tourist attractions. The bus and trolley system is operated by the Local Transport CompanyTursib. Bus and trolleybus tickets can be purchased at ticket booths. Information about schedule and routes are available at the Tourist Information Centre, Sibiu Airport (Arrivals Hall) and several other locations within Sibiu (for a complete list please visit our Tourist Info section). (available by advance reservation only). Open: daily from 8 a.m. until 6 p.m.
- VAT tax (19%) will be additional. - Rates include helmet and lock. Sibiu - Rasinari - Gura Raului - Poplaca - Sibiu. Taxis are still relatively inexpensive and widely available. Prices per km are marked on the front passenger door. For a list of available accommodations in Sibiu please click here or check our Accommodations Guide. Sat. : 10 a.m. – 1 p.m. Sat. : 10 a.m. – 2 p.m. Folk crafts, such as embroidered clothing and linen, painted or beaded eggs, carpets, pottery, woodcarvings and icons make interesting gifts and souvenirs. 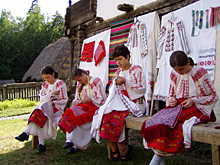 Romanian peasants do magnificent embroidery on cotton, wool and leather. Look for blouses, skirts, exotic coats, rugs, tablecloths and lacework. Icons, new and old, painted on glass or wood are outstanding. as well as local cheeses and fresh dairy and meat products. near Podul Cibin (Cibin Bridge). Location: Strada Rahovei, neat the SE end of Bulevardul Mihai Viteazul. Location: SE of the Old Town on Str. Semaforului. Open: Tue., Fri. and Sun. Numerous vendors offer a great range of goods that attract numerous locals and visitors. Location: northern part of Sibiu at the intersection of Drumul Ocnei and Strada Oborul de Vite. Mon. - Fri.: 9 a.m. - 8 p.m.
and information on accommodations, restaurants and transportation. Open: Mon. - Fri.: 9 a.m. - 5 p.m.
Open: Mon. - Fri.: 8 a.m. - 4 p.m.
Open: Mon. - Fri.: 8 a.m. - 5 p.m.
Open: Mon. - Fri. 8 a.m. - 3 p.m. Wed - Fri: 9 a.m. - 6 p.m.
Open: Mon. - Fri. 8 a.m. - 4:30 p.m.
Mon. - Fri.: 7:30 a.m. - 1 p.m. Sat. 8 a.m. - 2:30 p.m.
Open: May through Sept: 9 a.m. - 5 p.m.
International Access Code +4 (country code) + 0269 or 0369 (area code) + telephone number (six digit number).